One of the greatest charms of Venice is its Grand Canal, intricate network of winding waterways and lagoons and all the art, history, culture and everyday live that exists on these waterways. If you love being on the water, here is a five-night Venice cruise that will allow you to holiday afloat in Venice and the Po River Delta. Anyone who knows Venice will know that hotels along the Grand Canal are very expensive and although this cruise doesn’t travel a great distance away from Venice, it can be a nice home on the water for your Venice vacation. The river boat is moored in Venice for three nights of the 5-night cruise. Following is a sample 5-night itinerary taken from CroisiEurope’s “Venice and the River Po” cruise on the MS Michelangelo. CroisiEurope is a major player in the European river cruising industry. This is a French-owned, family-run company so on this cruise you can expect a distinctly French touch on cuisine and services. 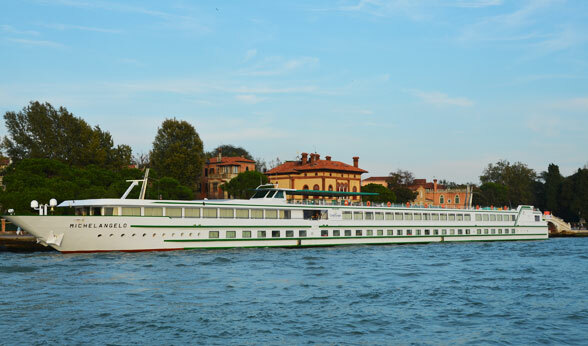 Embark the MS Michelangelo from 18:00 at the Venice cruise terminal on Quay San Basilio. This evening the ship moves to the Quay of 7 Martyrs which is a short stroll from St Mark’s Square. Early morning departure for Taglio di Po. 13:30 – Optional excursion to Padua. Ship then continues to Polesella. Dinner and free evening here. Optional excursion to Verona after breakfast. Ship then continues to Taglio di Po. Morning stop at Chioggia. Time to explore this area at leisure. Ship sets sail at lunch time and reaches Venice at 15:00. Optional tour of Doges Palace and St. Mark’s Square. Dinner on board and free evening. Optional morning excursion to Murano and Burano, famous for glass and lace respectively. Lunch and dinner on board and free time.